Full Itinerary | What is included | What is Excluded | Book now! The tour will start in Kigali Rwanda where you will go for a tour of the city and then drive to Uganda through Musanze region in Rwanda. Gorilla tracking will be done in either Rushaga, Nkuringo, Mgahinga, Ruhija or Buhoma regions since they are a bit closer to Uganda - Rwanda border. This tour is recommended incase you do not want the trouble of traveling fro 9 hours from Kampala to Bwindi. This safari is shorter and enables you to track Gorillas in a very short time and on a very affordable Budget. Doing this Uganda gorilla trekking tour from Kigali is recommended since the gorilla permit is cheaper in Uganda as compared to Rwanda. Therefore if you have limited funds and have a short time on your vacation, you can enjoy the gorilla trekking experience as well. 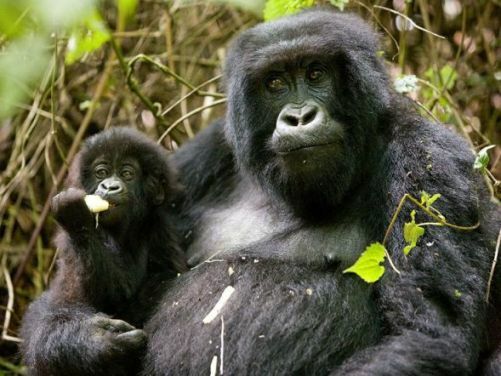 Book your 2 days gorilla trekking Uganda tour from Kigali Rwanda now! Gorilla trekking best time to go in Uganda is usually in the dry seasons: December-January and June-August. Day 2: Gorilla trekking and transfer back to Kigali for the flight back. Uganda WIldlife Authority (UWA) provides more information about Bwindi Forest National Park. Our driver will meet you at the Airport or hotel to kick-start our safari. You will go for a Kigali City tour. From Kigali, you will head to Uganda through Musanze region of Rwanda. The drive gives you beautiful spectacle of the country with "a thousand hills" before exiting Rwanda from Chanika Border. We head to Lake Mutanda which has a rich photographic opportunity. From Lake Mutanda, we head to the lodge in Kisoro town or in Bwindi for the overnight awaiting the gorilla trekking experience the next day. Another route to Bwindi is through Katuna Border. With this route, from Kigali we head north towards Katuna border. Upon crossing, you will head to Kabale Town known as "The Switzerland of Africa". We can have a stop at lake Bunyonyi for relaxation and pictures and then settle in our lodge for gorilla tracking the following day. This is the gorilla trekking day. Early in the morning, you will gather at the park offices where you will find fellow trekkers. Please make sure you let the ranger know your interests before attaching you to a group. Some gorilla groups require a certain amount of physical fitness and might not be favorable to every one. 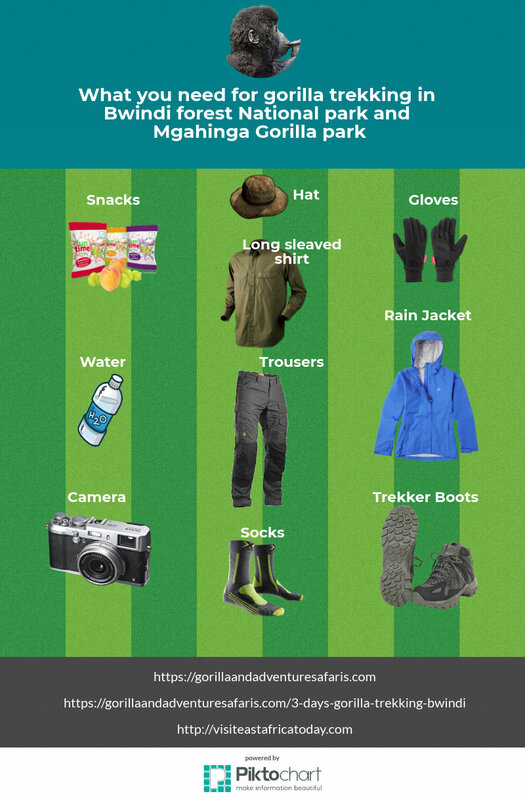 Therefore availing this information to your ranger will help him to organize the best gorilla group to track. Here you will be grouped(8 people) and the ranger will take you through the rules or Do's and Dont's of gorilla trekking.and then he will lead you into the forest to track the gorillas. The ranger uses radio communication to stay in touch with the trackers who head into the forest way before you start on your way into the forest. The trackers inform your ranger about the whereabouts of the gorillas and direct him to the actual location of the gentle giants. You will then spend a maximum of 1 Hour in the presence of the gorillas. Here you will be able to take pictures and observe the way of life of these primates. After the experience, you will trek back out of the forest. Our driver will be waiting for you and will take you back to Kigali for your flight back home. Book your Uganda gorilla trekking tour of Bwindi from Kigali Now! 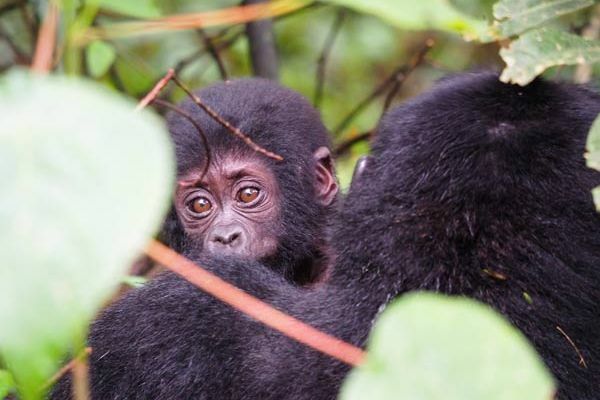 The 3 days Gorilla trekking tour takes you to Bwindi, Uganda for Gorilla tracking, Birding, Primates, Nature sounds and some wildlife adventure. A Uganda 10 day Itinerary (Tour package) for primates( Gorilla, Chimpanzee, etc), Big five, White water rafting and wildlife in Uganda's National parks. 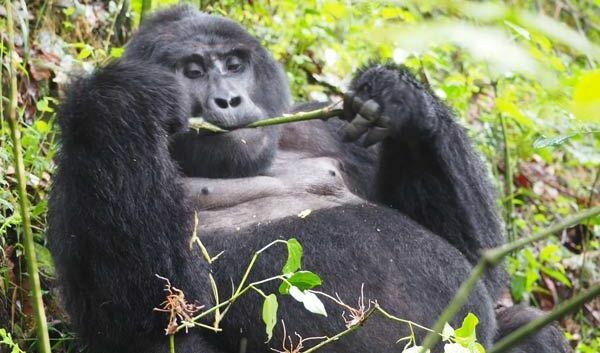 A 5 days gorilla trekking Bwindi and relaxation Safari at lake bunyonyi. A safari for birdwatchers, Canoeing and Gorilla tracking expeditions. Check out more of our Uganda Tours!